Note: You can save 20% off your Siggie Lodoen bra with the code SLS20 until March 15, 2019. If you’re a female runner, chances are you own at least a few sports bras that you wear only when they’re the last clean bra. Or maybe some that fit so well that you save them for long runs and race day – you don’t want to “waste” them on a 4-mile easy pace training run. That’s the thing with sports bras. You might have a few with crusty, chafe-inducing bands, or one with a bent hook that you still wear because at least they control the bounce. Thinking about it, there’s a lot that needs to go right with a running bra. They’re now helping thousands of runners find the right bra through their website, siggielodoen.com. This is great news, especially for one group that always has a hard time finding a bra that gives the right support, smaller women with larger breasts (in the 30-36″ range with D-H cups). Some sports bras do nothing to battle the tennis-ball-in-a-tube-sock action that can happen when the breast tissue and skin bounce and stretch. That’s because, says Paulson, “the average sports bra doesn’t use fabrics that are high-quality and substantial enough so the fabrics sag and stretch too much which means that your breasts sag and stretch as well.” Most sports bras rely only on compression or encapsulation, and are far too wimpy to provide support for larger breasts. A logistics expert for a national company in a previous life, Paulson’s true passion was fitness. She was frustrated with the sports bras on the market, and knew there could be a better solution. So she partnered with her friend Richard, a NASA spacesuit designer (no big deal), to design the Siggie Lodoen sports bra. “I knew what women wanted and needed, but Richard knew how to turn those ideas into a high-tech garment engineering-wise,” says Paulson. “It was so cool to work with him. 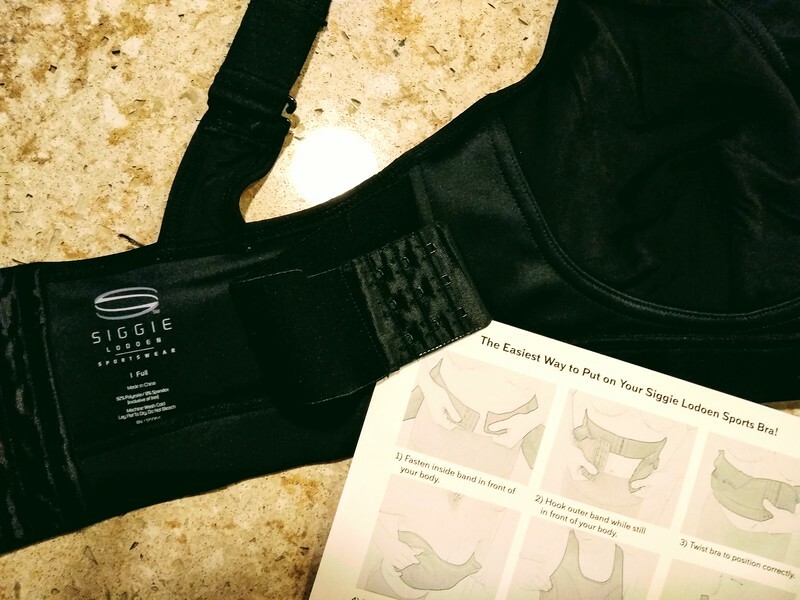 He even conducted bounce tests on my sports bra compared to other sports bras on the market.” In these tests, the Siggie Lodoen bra allowed only 2.18 inches of bounce, while the other bras tested allowed 4.28 inches, 2.93 inches, 2.44 inches, and 3.10 inches. The bra is an encapsulation/compression combo and offers three adjustment points. First, the shoulder straps can be made shorter or longer. The G-hook makes a solid connection which can be made even more solid by sewing the front and back straps into one long strap. And if you’re not a sewer? Paulson has you covered. “I simply ask them for the length of straps they prefer and then have our seamstress do the work.” And this is a free service they offer. The back of the Siggie Lodoen bra has 3 rows of 6 hooks and adjustable shoulder straps. This SpaceBand is the second place you can adjust your fit. It’s a wide elastic band that hugs the breast tissue comfortably to the torso. It’s not so tight so as to leave you short of breath, and once it’s fastened and adjusted (see below) you really can’t even feel it, but it’s not a feature that any other bra has. The final point of adjustment is the back. Three rows of 6 hooks help you find the right fit around, and the satiny materials has an incredibly smooth, soft feel. You might think 6 rows of hooks are overkill, but I (who have had 2 kids and pumped for a year for each of them) have found that this extra wide span of hooks does a great job of providing a foundation for the bra’s marquis feature: the SpaceBand and under-breast elastic structure that stops bouncing. Note: the hook-and-eye closures are meant to be done in front before sliding the back of the bra around to your back. The Siggie Lodoen sizing chart. Let’s say, for example, your underbust measurement is 36 inches, and your full bust measurement is 42 inches. The difference is 6. So you would wear a size 2 Full. If you order a Siggie Lodoen bra and it’s not the right fit, you have 30 days to return or exchange it. You’ve probably picked up on this by now, but this company wants you to have a well-fitting bra! If you don’t have a seamstress measuring tape to get your measurements, you can use a scarf or belt, wrap it around your torso at these two points, and then use a ruler to measure the length of the scarf needed to get all the way around your body. The width of the straps and the material around the body gives a snug fit without creating any bulges (some bras do that, and they really should stop), so this is a bra that I’ll feel comfortable rocking solo when the weather gets hot. It’s almost like a crop tank, and becuase this bra stops the bounce, I won’t feel self-conscious running without a top. I rarely run in just my bra because my chest needs no additional attention brought to it. Designed in the U.S., the bra is made overseas and their manufacturer is BSCI Compliant, which means “workers are protected by International Labor Organization conventions and declarations, the United Nations Guiding Principles on Business and Human Rights, and guidelines for multinational enterprises of the Organization for Economic Co-operation and Development.” I don’t know about you, but this is important to me and I wish it was a more frequently-touted designation! One last thing I want to mention: how to put on a bra. My Siggie Lodoen bra came with an instruction card on how to properly put a bra on. You can see the card in this photo above of my bra, which also shows the inside of the Siggie Lodoen sports bra. The band that’s folded over in that photo, with 3 rows of 3 hooks, is the SpaceBand. It is between the two layers on the bra’s cups and is what stops the bouncing. You’ll want to play around with which hook works best for you on the SpaceBand, after putting the bra on and making sure your breasts are snug within the cups. I had no trouble re-adjusting this with the bra completely on. This bra is just the start for Siggie Lodoen. “I will be making version two of the bra later this year using the feedback received from the 600 Kickstarter backers who supported the project, as well as the feedback from online customers who are currently purchasing through siggielodoen.com,” says Jennifer Paulsen. The Siggie Lodoen bra can be purchased online for $79. Learn more about the Siggie Lodoen bra at siggielodoen.com – and remember, right now they are offering 20% off with the code SLS20.